This is another one of those questions I get asked a lot: 'Should I be using a white or grey background with coloured gels?' As with so many things in photography, the answer isn't always as simple as you might think. 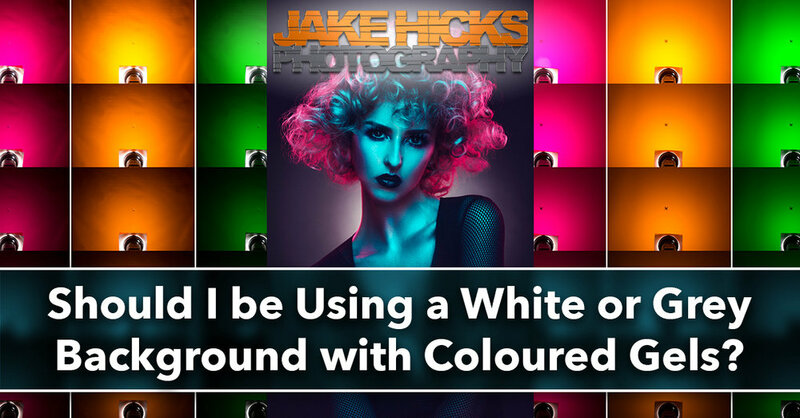 In this article I show you a recent lighting test where I fired a collection of coloured gels onto a white background and then repeated the same test on a grey background to see the difference. The images below speak for themselves but I'll also explain some of my personal reasons for using one over another and I'll also discuss the pros and cons for each. As well as a coloured gels I also used a 'diffusion gel' (sometimes refereed to as a 'frost') on each of the shots. This gel helps a lot in the reduction of colour banding of gels on open reflectors like this and I would always try to use them when shooting a backdrop regardless of the colour. The first set of shots were agains the white backdrop. Here's the resulting images. Next up I changed the background to a grey one and repeated the exact same test. Here's the resulting images from a grey backdrop. Click to enlarge: Grey background shots. Although the whole point of running a test like this and showing you the results means that you can draw your own conclusions, I'll add my own thoughts here and you can choose to agree with them or not. Firstly and most obviously, grey as a gelled surface heavily reduces the amount of light in the shot. In fact the whole grey light test is one stop brighter throughout just to show vaguely similar results. This extra darkness does have its own pros and cons though. To begin with, it's clearly going to be far easier to get a strong vignette (dark corners of an image) on the background if that's what you're after. The coloured light drops off very, very quickly which means that a tight spot of light is far easier to achieve. If however you're looking for a more gradual colour on the background with very little vignetting, perhaps a grey backdrop isn't the way to go. Secondly we have a slight concern with the colouring in some of the lighter coloured gels like the yellow. Shining the yellow onto a white surface is always going to yield cleaner results in my opinion over shining it onto a grey. Sure it's still usable at certain exposures but look at how you have less usable exposures in the grey than in the white. Think of it like painting with watercolours onto a white canvas and then onto a grey canvas. The white canvas underneath is helping to give that colour its saturation and often the resulting colours on a grey surface can appear muddy in comparison. Imagine trying to use pastel coloured gels on a grey background (this dawns on me now as that would have been useful to test too), using pastel gels is hard enough on white but practically impossible on grey. Like I said, this is really only prominent in the lighter, less vibrant colours and in the more saturated colours like the reds and blues it's far less noticeable. So if we combine those two concerns of heavy vignetting and muddy colours with the grey backdrop do we have a problem? Personally I feel we do. If we take the very strong contrast (the speed at which the colour drops from highlight to shadow) of the grey backdrop and then combine that with the fact the gel colours are designed with a clean white surface in mind, we may find the colours difficult to control. Click to enlarge: The image on the left is against a grey backdrop and the image on the right is against a white backdrop (grey backdrop image one stop brighter to compare). It's my feeling that you will get muddy colours appearing across the grey backdrop versus the clean white one regardless of the colour that you're using. The white backdrop produces a far smoother and more even colour in comparison. The other issue I have with the grey is the fact that due to its rapid change from highlight to shadow, it visually creates a lot of contrast which with colour translates to saturation. All gels have what I call a 'saturation limit'. This saturation limit is not down to the gels themselves but often the technology we use to capture them and the limitations they have. Take a look at the shots below to see what I mean. Click to enlarge: Here we can see where the camera stops being able to see variations in colour and starts to group similar colours together. This is what we often refer too as colour banding. When our gels reach their saturation limit, the camera starts to group these colours together, the resulting effect is often referred to as colour banding. You should be able to see this above, particularly in the pink where the colour seems to 'step' from one colour to another. This same effect will happen on white backdrops as well (and you can see it in the test shots) but due to the contrasting nature of gels on a grey backdrop, it's far easier to get this ugly effect to show itself on a grey background. You'll see this effect of a saturation limit appearing a lot on portraits of people because skin is not white, as a result people tend to have the gels too powerful to get the colour to show through resulting in this saturation blow out. Lastly I'll just add that I think grey background gels has become a thing because it's easy. A little knowledge is a dangerous thing and the rise of anybody like myself writing a blog post or making a YouTube video can pass on any info we like regardless of whether we've actually tested it or not. Using gels against a grey backdrop produces strong vibrant results that are very hard to blow-out (overexpose) but it gives you very little room for adjustment. Look at the shots at the start of this article again; how many stops of variation are useable colours against the white backdrop compared to the grey? For me, the answer is easily 3 or 4 white background shots of each colour are usable compared to only about 1 or 2 stops of usable colour on the grey. Lastly I just want to make it abundantly clear that I've provided the shots above so that you can make your own opinions on what you think works best. I'd hate to think that I'm preaching or forcing my own opinions on you without backing it up with evidence or tests at the very least to substantiate what I'm saying. For me personally though, I would never use a grey backdrop with gels. Have I used a grey backdrop with a backlight? Absolutely, I love that strong, fast drop off of light and aggressive vignette but I wouldn't add a gel to it to colour my backdrop. If I wanted a gelled background I would always use a white backdrop because it offers me so much more control and more importantly for me a cleaner colour. I would personally only use a white backdrop with coloured gels. It offers me far more control and in my opinion a far cleaner colour with less vignetting. Using a grey backdrop is an excellent way to get strong and contrasty vignettes behind the model with white light. They're perhaps not the best choice however if you're planning on gelling them. Like I mentioned at the end of my conclusions, grey backdrops are very easy to use with gels. The biggest problem people have when using gels in general is overpowering them. Doing this will quickly expose the gels saturation limit and you're left with ugly colour banding issues, something that is far easier to do against a white background. A grey backdrop makes this overexposing issue incredibly hard to propagate resulting in this illusion that grey backgrounds are a must for coloured gels. You'll see this same illusion appear with other people who teach the use of gels, they'll often have a black or dark skinned model because their dark skin is incredibly easy to gel, but unfortunately it's a lot harder to show a strong tonality from light to dark. Imagine them trying to do a pastel gels shoot on a dark skinned model. Almost impossible. If you're interested, the gels used in this test were all from my 'Definitive Colour Collection' Gel pack. Clicking on the image above will take you to my products page. The 'diffusion' gels I used in this lighting test can be found in my 'Utility Gel Pack'. Clicking on the image above will take you to my products page. :WARNING: Everything BUT Black Friday deals below!